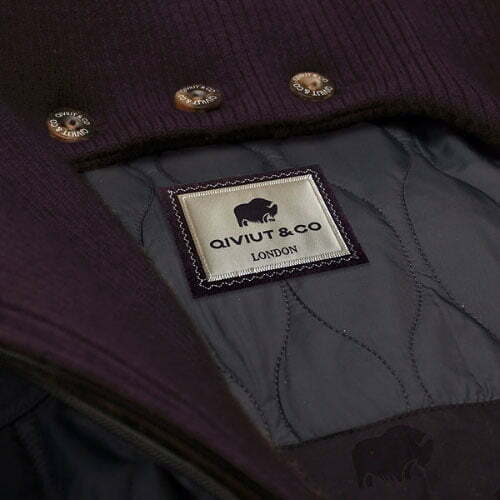 If you are in the Greater London area, living, working or just visiting, you can use our bespoke try-on service to sample The Qiviut Jacket in person and be assured of correct sizing. Just contact concierge@qiviutandco.com or call 0800 689 3643 to arrange an appointment at your convenience and venue of choice (home, office, hotel etc.). Appointments are available seven days a week. 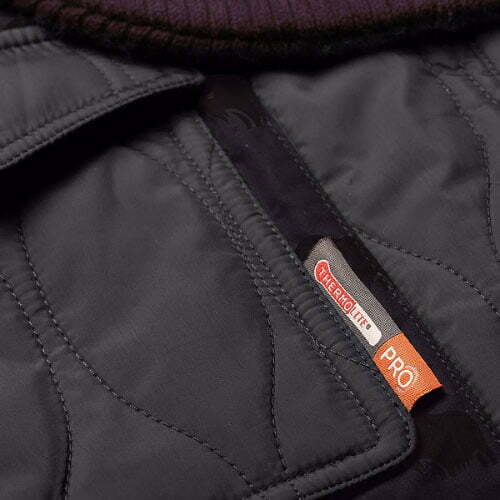 Our flagship product providing unparalleled thermal performance in a slim profile unmatched by feather filled garments. 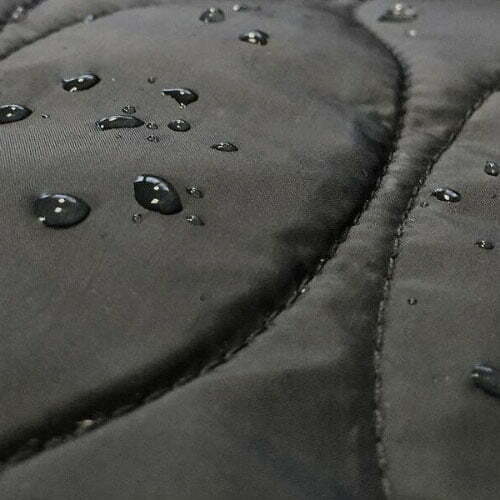 Water resistant outer shell. Unique “sandwich” insulation technique combining musk ox fibre with high performance synthetic. 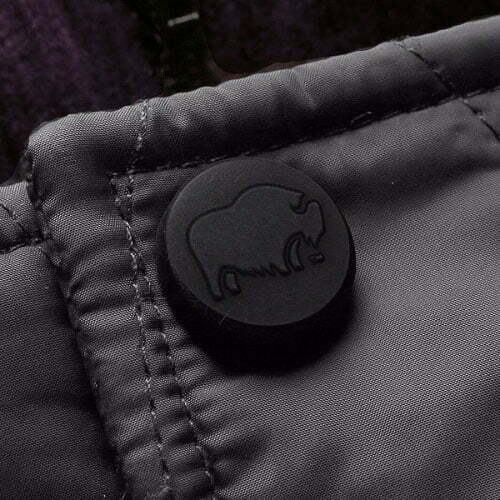 Musk ox pattern jacquard print lining. Two-way zip. 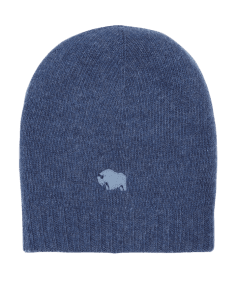 Qiviut blend knitted trim for wrist closures, arctic collar and wind baffle on hood. 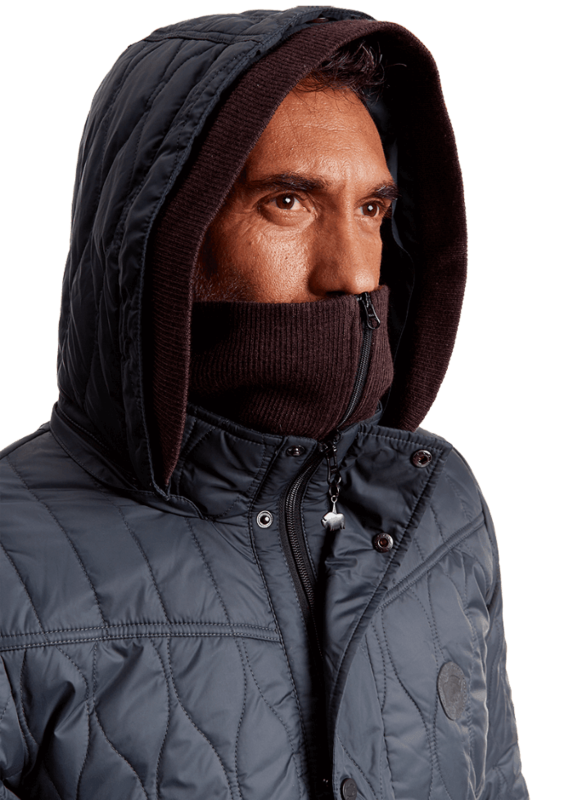 Removable collar, hood and baffle for differing weather conditions, social settings or personal preference. 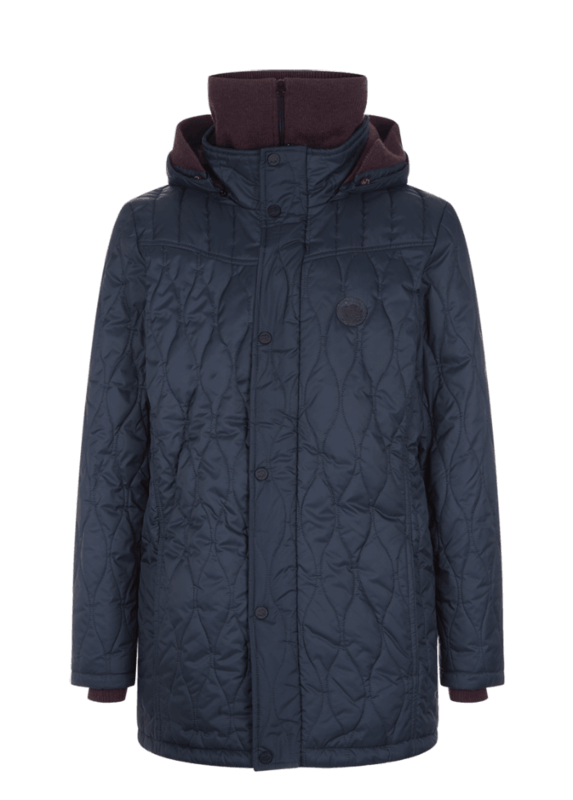 Fits true to size for men and women. 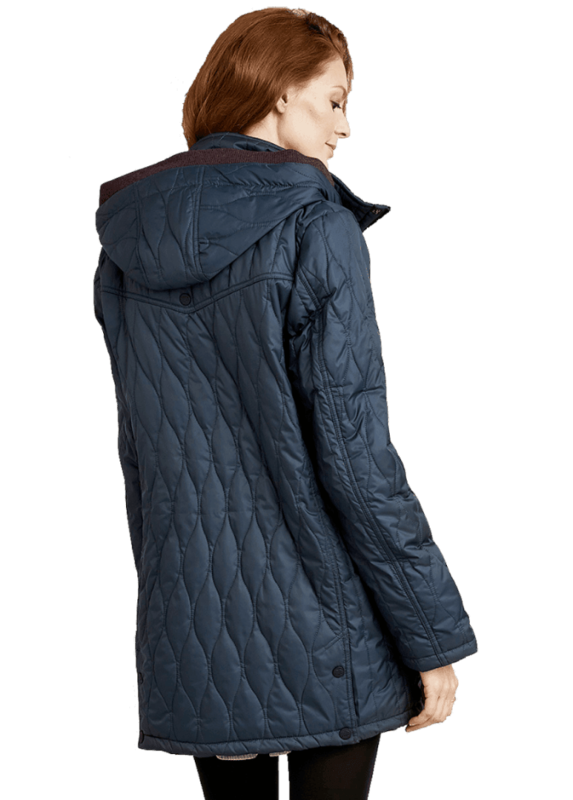 However, because of the jacket’s thermal capability fewer and/or less bulky under layers are typically needed so keep this in mind in deciding on loose or snug fit preference. 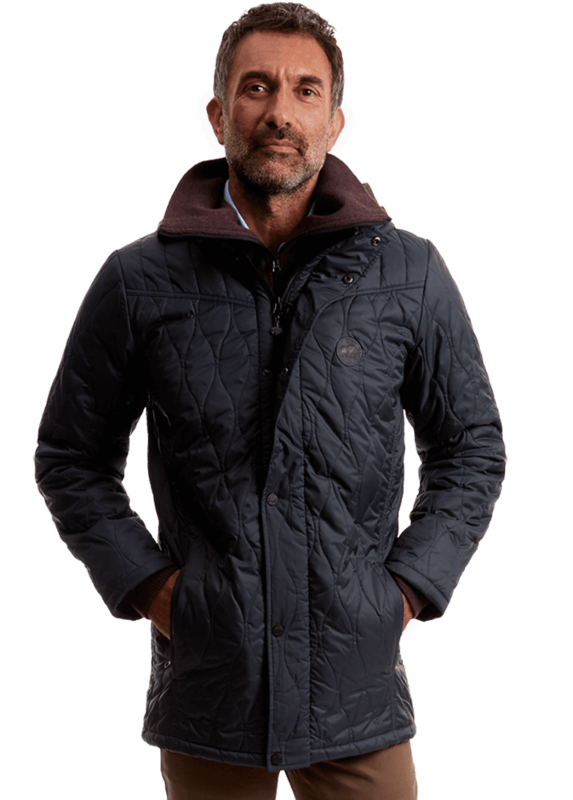 Male model (in photo) wears a L and measures: chest 40″/102cm, waist 34″/86cm, height 74″/188cm. 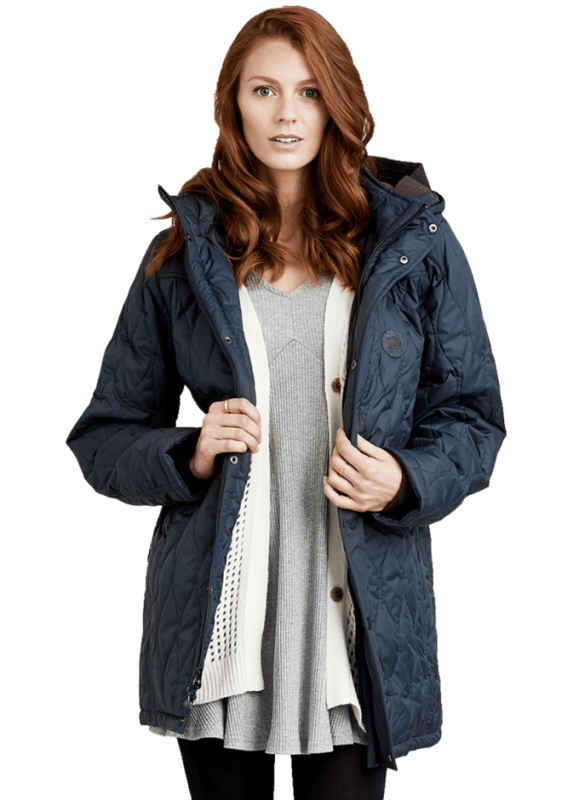 Female model wears a S and measures: bust 32″/81cm, waist 25″/64cm, hips 35″/89cm, height 70″/178cm. For a more detailed description about sizing and product measurements click here. • Two-way heavy duty zip. • Double vented with liveried snaps. 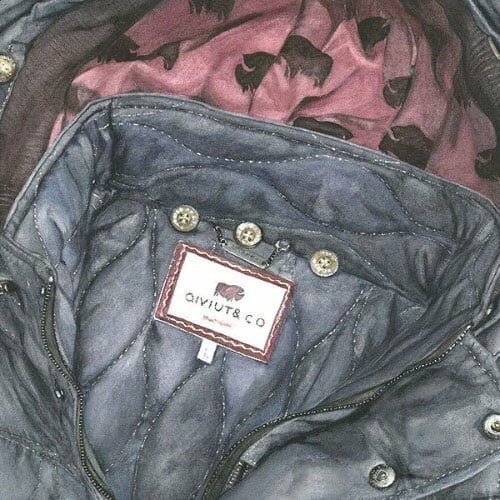 • Two outside zippered slash pockets and one “secret” zippered placket pocket with velour lining; two interior snap storage pockets with velour lining. 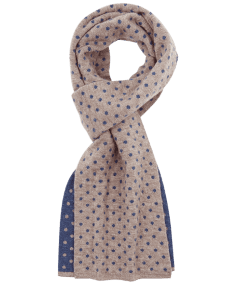 Orders received by 2PM UK time despatch the same day or, if later, the next business day. Estimated delivery time is 1-2 days within the UK and 2-5 days to the rest of the world. Shipping is free to allowed destinations worldwide and for all returns or exchanges. 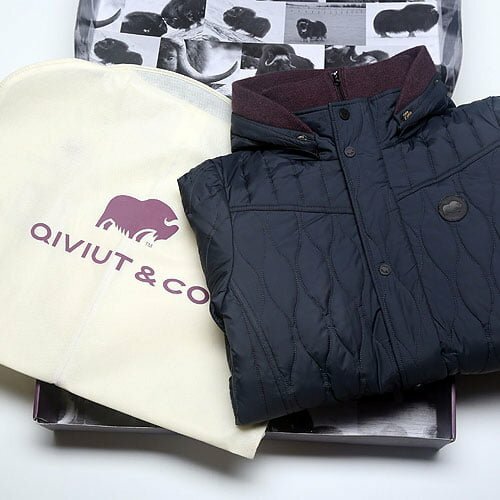 Any QIVIUT & CO item may be returned or exchanged within 30 days of purchase under our generous “no questions asked” return policy. For a more detailed description about shipping, returns and exchanges click here. 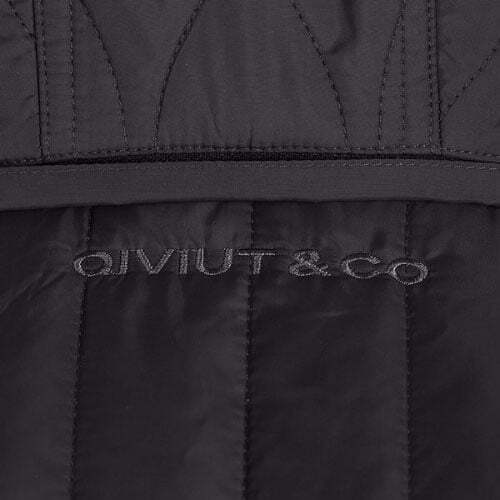 The Qiviut Jacket was designed with a slavish attention to detail. 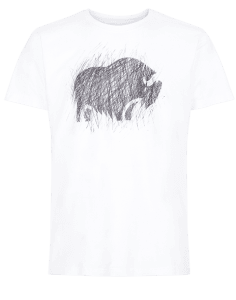 Lined with a musk ox jacquard print. 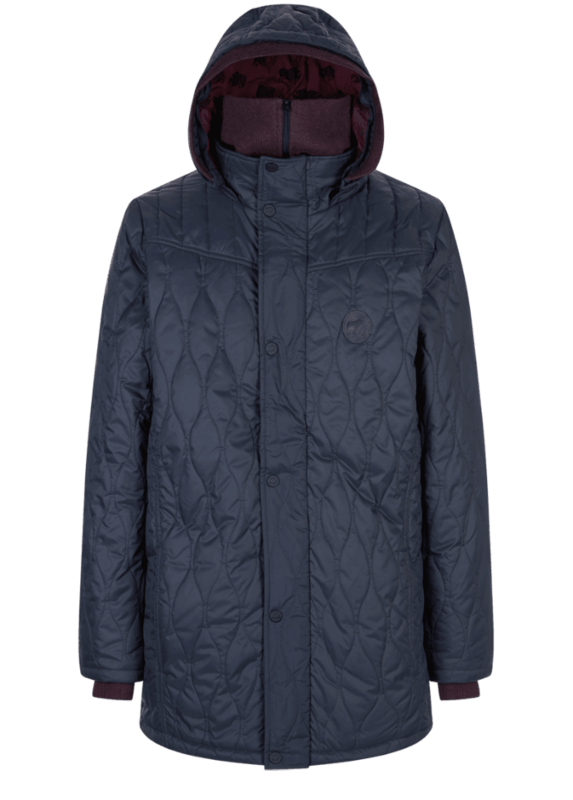 Detachable arctic collar, hood and hood trim. Specialist clean only. 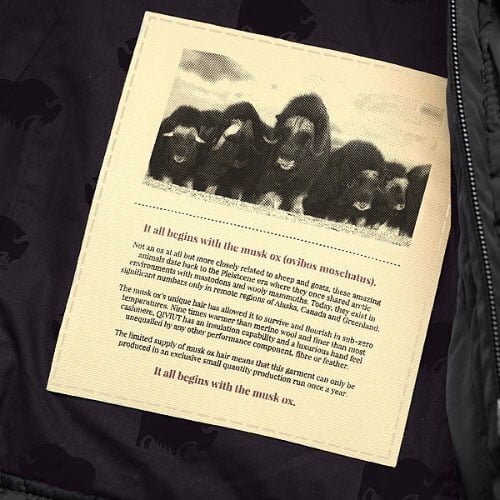 Comes in bespoke packaging with a carrier bag for transport or storage and a Certificate of Authenticity identifying the owner and the Limited Edition jacket number. 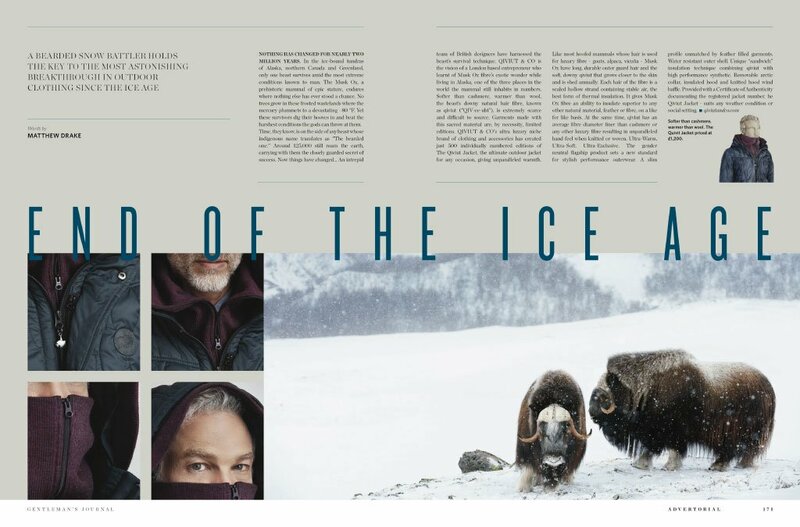 Have to let you know how happy I am to have THE coat with me on our trip to the Balkans. We have had record low temps. (Highs of 0 Celsius)!!! I have been toasty warm the whole time. The jacket arrived yesterday. It is a work of art and Jim loves it. Thank you for your help and advice. 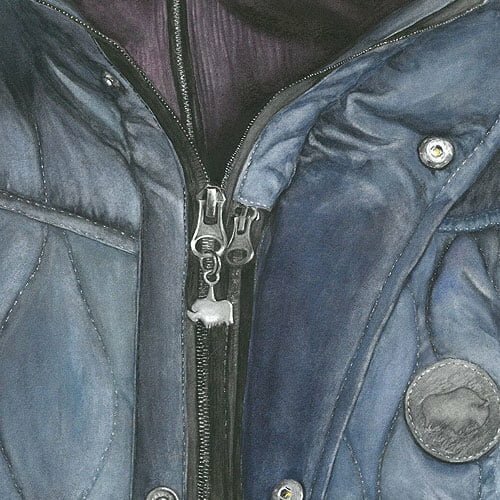 Download our free 40 page guide that will tell you everything you should know before purchasing outerwear.It covers garment types, construction and features, as well as the advantages, disadvantages and ethical considerations of different types of insulation and trim. A wealth of data.